I promise I used the three separate vertical panels required of the sketch this week (although I recognise that my proportions are all wrong!). I even used two different Prima paper pads but they coordinate with each other so well it is hard to see that the two outside panels come from Natures Garden and the central panel is from Fairy Belle. I didn't like the line where the panels met so I covered one with a thin shiny ribbon and the other with a much larger organza ribbon and now of course it's hard to see them at all and it looks like I have 4 panels instead of three! I used this gorgeous Elisabeth Bell "Dragon Flight", coloured with Copics, which you can find here. I added some stamped dragon flies to the left hand panel which are now entirely obscured by my ribbon. The two embellishment dragonflies are cut with a punch and I used three different colours of clear sparkly Stickles on all of the different wings. A little lace has been added to represent the scallops beneath my old Lakeland pierced paper Happy Birthday sentiment ribbon and there are lots of gems to make this card extra girlie. This slightly different perspective shows up two of the colours of Stickles on the wings of the dragonfly under the fairy. 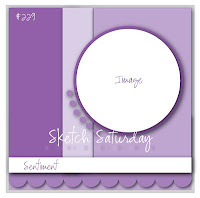 My teamies over at Sketch Saturday have produced some fabulous creations for you to see. Do stop by their blogs and share some love and then come along and play with us. Loves Rubber Stamps #21 "Bling Baby Yeah! Papertake Weekly "All Creatures Great and Small"
Creative Inspirations #184 "Anything Goes"
Crafts and Me #105 "Anything Goes"
And here are some other ingredients I used today just to enable me to function. Having rallied briefly a week ago, I am now feeling terrible again; full of cold, cough, headaches and other aches and pains. Its been two weeks now and I'm feeling horrible but at least the waterworks infection cleared up! Ohhh this is so adorable and beautiful Lesley!!! Oh this is so pretty Lesley,hope your feeling better soon!! OMGosh this is so cute! I love the image and the bling and the great card design. Hope you are feeling better soon! Thanks for playing with us over at Loves Rubberstamps!!! This stamp is just so sweet and love all of the dragonflies and the absolutely beautiful paper you've used. 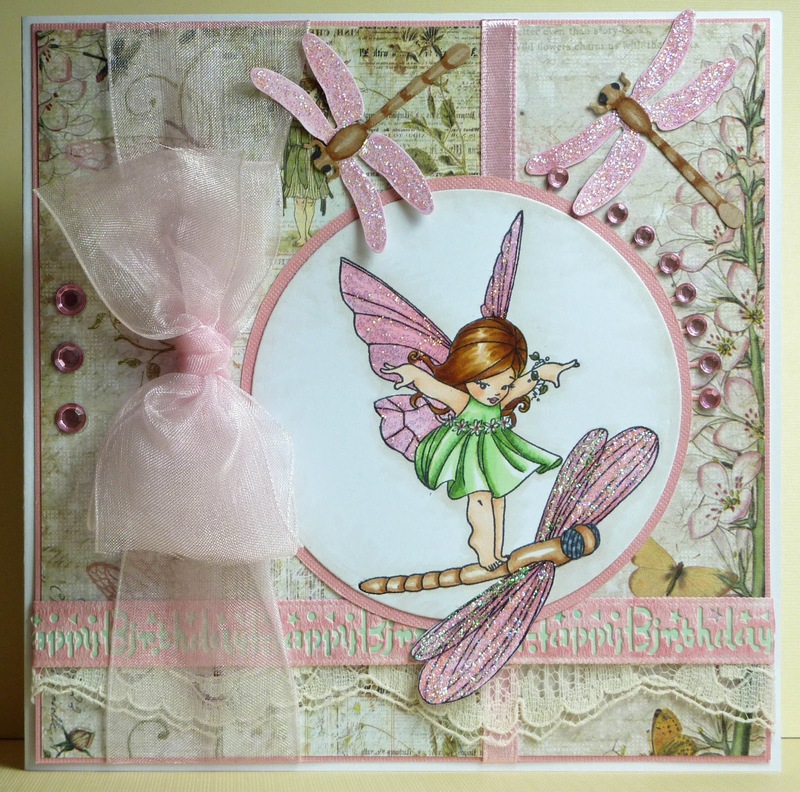 A stunning card Leslie, love the image and gorgeous dragonflies. Hope you feel better soon hun. 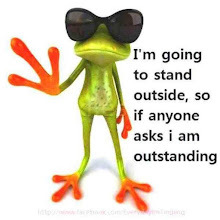 Hi Lesley, hope you will fell better soon. Argh!! My pink fix for the Weekend. My poor Lesley. So sorry you have relapsed again. I am not sur about the thing Mrs. A suggested, but they sound like fun, so if it involves alcohol, Go for it. The card is gorgeous by the way. Love that pink bow. Hi Lesley, what a cute card.. such a nice image and lovely colours.. the papers are perfect, just fantastic :-) Hope you're feeling better soon! 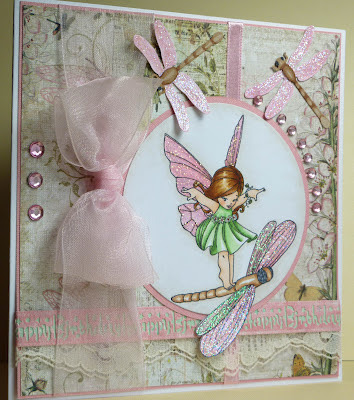 This card is adorable, Love the colors that you used as well as all the detail on your card! Thanks for playing with us at Loves Rubberstamps! Are really lovely card Leslie, really like the colour scheme and all the delicate embellishing. Many thanks for joining our Punch Away theme at Stampalot challenge this. Gorgeous card Lesley, love the punched border. Hope you feel better soon. Thanks for joining us at Stampalot this month. Oh I love this sweet card. Adorable image and the papers goes so well with it. Oh goodness! Hope you feel much better soon Lesley. Your card is just darling and I love that gorgeous yummy big bow. Hugs! I am so sorry to hear you are sick Lesley. 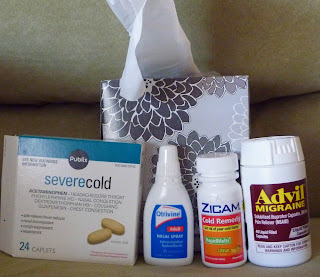 It has been a bad cold season here too. This card is beautiful. I love the shiny ribbon. Some of my favorite. Take care and get well soon. So beautiful Lesley. The image and the colours are so pretty. Beautiful Lesley. I believe you, now if that were me they would have to believe me too as all the panels would be get hidden with all my embellishments, lol. Hope your well, I'm catching up in my lunch hour, this is what it has come to. Oh Lesley I think with that lot it's a resort to 'Kill or Cure' !!! I hope it cure and you are still feeling much better soon. Your card is gorgeous, such beautiful colours and papers. Your details are stunning and your little imate is delightful. love the sparkly wings on those dragonflies, and an adorable fairy card. I hope you are feeling a little better by now and able to craft again. This is soooooooooo gorgeous sweetie I love all things with wings on & these dragonflies are so lush. Hope you feel better soon shug, take care. Heb alles bewonderd, echt super mooi allemaal...op 1 ding na,....Nu beterschapjes en langzaam opknappen hoor. Hi! 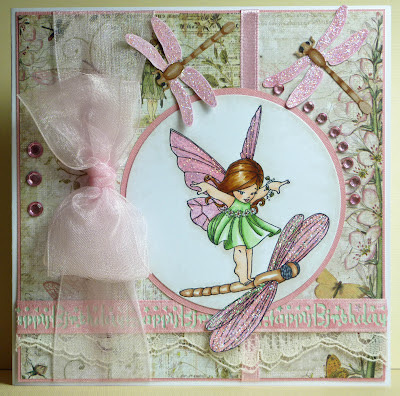 this is such a pretty card,gorgeous detail and colours-love the sparkle too.